Look back a generation or two and it wouldn’t be unreasonable to think that the sport of tennis was more popular on consoles than it was in real life. Every publisher you could think of – Nintendo, Sega, Microsoft, Sony, 2K, Atari, Namco, EA, and many more – at least attempted to serve up an ace, with some of them taking multiple attempts with multiple franchises. With 2k’s excellent Top Spin and EA’s underappreciated Grand Slam Tennis the last in the line and now apparently both dead, the pickings have been slim in the current generation. But, with some solid sports titles on their resume, you’d imagine that Australian developer Big Ant Studios would have as good a chance as any of making the wait worthwhile. With AO International Tennis, it initially seems that they’ve dropped a perfect shot over the net. Providing a control scheme not massively unlike those we’ve seen in the past, the game is easy to pick up. In no time, you’ll be firing some audacious passing shots down the line that you’ve got no business in even attempting. Different shot types are mapped to the face buttons and triggers, though you do have the option of being able to play shots with the right analog stick, as well. Quite why anybody would choose to use the stick control is beyond me, given that it doesn’t really make much sense and rarely works correctly anyway. Buttons it is, then. In AO International Tennis, above and beyond shot type, power, and selecting a direction, the control scheme’s reliance on timing throws in an extra challenge when it comes to defeating your opponent. An indicator next to your player shows whether you’ve struck the ball early, late, or just right. If you roam too far outside of the correct timing zone, you’ll be punished by the ball firing long, wide, or at a less severe angle than you wanted. Early on, the majority of your losses will come down to you fizzing a ball over the far baseline by missing your timing, rather than by the AI catching you out of position and hitting a winning shot. In career mode, you’ll be leveling up your various skills along the way through the seasons as you progress from Futures events through to major tournaments and slams. Improve your numbers on your forehand slice and you’ll be more able to get away with a poorly timed shot of that type, whereas you wouldn’t get away with using the same timing with your lower-rated lob, for example. This kind of nuance gives AO International Tennis something of an organic feeling, where you never really feel as if you’ve mastered the game. No matter how many matches you play, a slight moment of impatience, hesitation, or forgetfulness could still be enough to cause you to crank a relatively simple volley over the line. It’s fair to say that you’ll rarely get to the point that boredom creeps in due to you knowing that you can win without trying. Stamina also comes into play in a new way. Long rallies take it out of your player and with low energy, they can’t hit the ball as hard or run as fast. Stamina is also affected by travel time when selecting which event to play next. Playing in London and then choosing to head straight to an event in Sydney will drain stamina more than making the shorter trip to a lower-paying tournament in Rome, which could affect your on-court chances. Combine this energy-watching with some sometimes truly impressive AI that can beat you with intelligence rather than with raw attributes such as power and speed, and you’ve got a game that puts up a stiff challenge. Was that the end of the story, we could say that Big Ant had cracked it and that Sony’s own forthcoming Tennis World Tour might as well not even show up to the court. Alas, this tale is not over. The flaws in AO International Tennis leave the door wide open so that the platform holder is pretty much free to just wander through it and take the title with even the most average of performances. 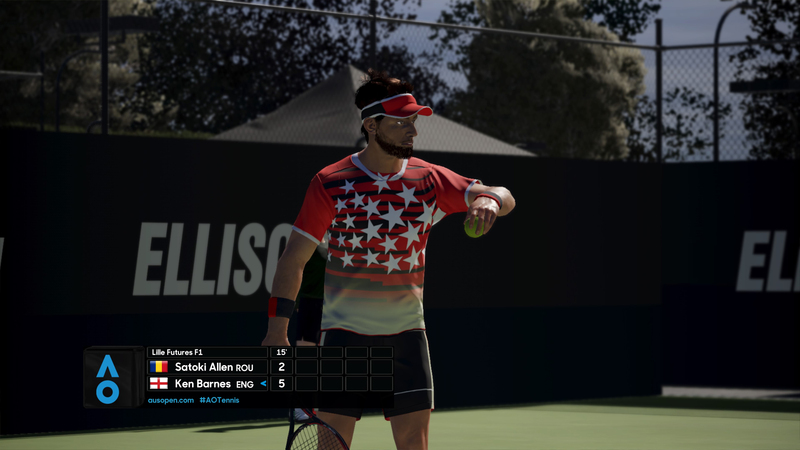 AO International Tennis relies on the matches themselves to provide 100% of the entertainment in career mode, as that’s the only thing you do. Win a first-round match, lose in the second round, buy a skill point with your prize money, go to the next tournament, win a first-round match, and repeat until you get bored. Sure, the gameplay is often tense and exciting when you’re facing off against an opponent with similar numbers to yours, but there’s nothing whatsoever in place to break things up. There are no training games to be had, no rivalries, and all the lesser tournaments feel identical, aside from changes to the playing surface itself. Serving at match point in Amsterdam, you may as well be in Abu Dhabi, Glasgow, or a park in downtown Vladivostok for all it matters. This is especially jarring given that the game contains a relatively decent stadium editor, but the development team doesn’t appear to have bothered to use it themselves for very much. As the title would suggest, the Australian Open (yes, that’s what the “AO” bit stands for) is licensed, but that’s it as far as real-world tournaments go. 18 licensed players appear in the game, including cover stars Rafa Nadal and Angelique Kerber. To counter-balance this somewhat anemic dose of reality, a player creation system is on hand to allow for the community to make and share players to pull into your game. The developer has even cheekily seen fit to include voiceover recordings of names such as “Djokovic,” so you can use them on your entirely fictional created player who definitely isn’t likely to be a certain Serbian champion named Novak. Not that names matter in this game, given AO International Tennis’ fictional players haven’t had much thought put into them. There aren’t many Colombians called Paul Murphy or Norwegians named Chung out there in the world, but maybe that’s because they all seem to have ended up here. The occasional little quality of life inclusions such as the player editor doesn’t make up for the fact that the limitations of the career mode aren’t the only broken string on AO International Tennis’ racquet. The biggest problems are on the court itself. Animations have been cleaned up since the game’s Australian launch back in January, but a lot of them are still present. If a ball hits the net before reaching you, you’re all but guaranteed to lose the point, since your player will refuse to take more than one attempt at hitting a ball. Lob shots cause bigger problems than they should, especially if they’re long. Somehow, the game has issues keeping up when you’re running to the back of the court, causing juddering, missed timings and in the worst cases, skipping animations. That’s not all that ails the timing system, either. It’s way too tough to hit the ball exactly right, even when playing as one of the top real-world players. The window for that perfect shot is very small and seems to move when it feels like it. When you hit four perfectly timed forehand shots and play the fifth in a way that feels the same, only to find that you were massively early and hit the ball out, it doesn’t feel good. But the biggest downer is when AO International Tennis just flat out ignores you. Losing four or five points in a set because you’ve pressed a shot button, but your player does nothing due to being in mid-animation at the time, isn’t even remotely acceptable. Being ignored is never fun, but it hurts like hell here when you’re in a tie-break situation at the end of the fifth, and your player starts fiddling with his sweatbands as the ball that’s a foot away slowly bounces past him. Combine that and the shot timing issues with the hit-and-miss way that the game semi-automatically moves you around the court and the bigger picture really starts to fall apart. The problems are more than enough to make you decide to not play the next generic match in the generic tournament against the next generic opponent, who probably hails from China and is called Lars Olaf Uberswedish. 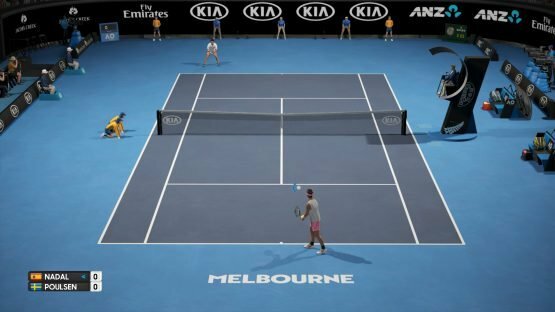 The ideas on show in AO International Tennis do suggest that with the bugs ironed out and a little more development time put into livening things up a bit in career mode, it could be a contender. The stamina and timing systems are enough to differentiate the game from the slew of tennis titles that have come before it and are undoubtedly good ideas. Ultimately though, the poor execution and the cracks in the gameplay cause this wildcard entry to fall well short of being a grand slam effort. AO International Tennis review code provided by the publisher. Version 1.16 reviewed on a PlayStation 4 Pro. For more information on scoring, please read our Review Policy.